MIAMI GARDENS, Fla. (AP) — For an NFL stadium, it will be a different kind of Sunday showdown: Roger Federer against John Isner. Both won Friday and advanced to the final of the Miami Open, which moved this year to the Dolphins’ complex from its longtime Key Biscayne home. Federer dominated a semifinal battle of the ages, beating 19-year-old Canadian Denis Shapovalov 6-2, 6-4. Defending champion Isner also bested a Canadian teenager, 18-year-old qualifier Felix Auger-Aliassime, 7-6 (3), 7-6 (4). Both finalists give the new tournament site a thumbs-up, partly because they’ve done so well the past week. The atmosphere was lively for both matches, and each time experience triumphed. The age gap with Shapovalov was the largest of the 37-year-old Federer’s career, and he used a wide array of shotmaking to take control with two early breaks. Seeded No. 4, Federer improved to 17-2 this year. He lost in this month’s Indian Wells final to Dominic Thiem and now seeks his fourth Miami Open title. Federer is 5-2 against Isner, but they haven’t played each other since 2015. 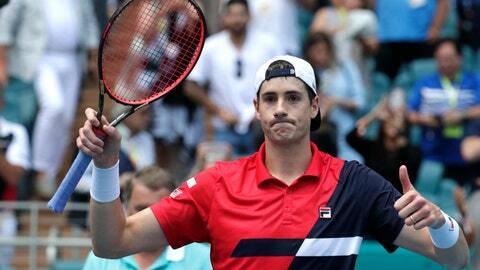 Isner, now 33, won his only ATP Masters title a year ago on Key Biscayne. The 6-foot-10 American hit 21 aces in the semifinal and has 98 in five tournament matches. Federer laughingly said he’ll brace for a barrage. The largest stadium crowd of the tournament watched Federer deploy his full repertoire against Shapovalov. That included a lunging stab volley for a winner, a half-volley drop shot for another winner, and a nifty chipped return while Federer held the racket like a flag, strings in front of his face. Shapovalov will climb to a career-best No. 20 in the rankings despite his defeat. Like Shapovalov, Auger-Aliassime came up short in a bid for his first ATP Masters 1000 final. He served for both sets, but Isner broke each time by taking advantage of double-faults, and then used his big serve to control the tiebreakers.